Note: Hydroelectricity article needs updated statistics and a rewrite. The practice of harnessing the power of water for energy production dates back to the beginnings of most world cultures as they transitioned from nomadic lifestyles to domestic agricultural lifestyles. Today’s turbine technologies associated with large hydroelectric power generation trace their beginnings to the late nineteenth century. Since that time the world has gone through about three different stages of hydroelectricity development, with each phase dealing with the construction of larger capacity, though not necessarily increased numbers of hydroelectric facilities. According to the Energy Information Agency, hydroelectricity accounts for the highest percentage of renewable energy generation in the United States. The remaining hydroelectricity generation is distributed among all the other states in much smaller portions. American formal interest in harnessing the power of water to create electricity often gets placed in discrete time frames. The first phase, from the 1880s to the early 1920s saw the construction of many smaller projects. Some important dates for the second and third phases are presented below. September 30, 1882: The world’s first hydroelectric power plant began operation on the Fox River in Appleton, Wisconsin. Between 1881 and 1896, the Niagara River area around the Niagara Falls were developed for commercial hydroelectric generation. Between 1933-1942 the Grand Coulee Dam, the largest dam in the United States, was constructed. It is located along the Columbia River in central Washington State. 1933 – Tennessee Valley Authority (TVA) established, bringing hydroelectric power plants to the Tennessee River Valley. 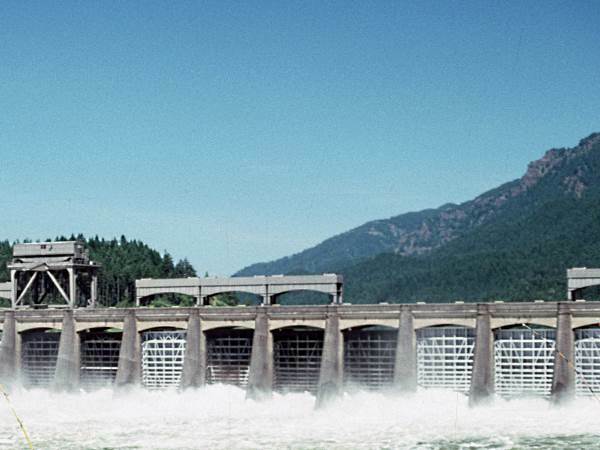 1937 – Bonneville Dam, the first Federal dam (pictured above), begins operation on the Columbia River. In 1945 hydroelectricity accounted for 94% of total electricity generation in Canada. Today it accounts for approximately two-thirds of all electricity generation. Between 1975 – 1991 construction on the Itaipu Dam was completed. It is located on the Parana River, bordering Brazil and Paraguay, and is the largest hydroelectricity generating plant in South America and second largest in the world, next to the Three Gorges Dam. 1989 – Work completed on the Sayano-Shushenskaya dam, the largest hydroelectric power plant in Russia. It is located on the Uehisei River, in the mountainous Republic of Khakassia, near the borders of Kazakhstan and Mongolia. Between 1994-2003 – Most of the construction work started and completed for the Three Gorges Dam, the world’s largest hydroelectric dam, which is located on the Yangtze River in China. People often ask, Where is hydropower used in the world? They are often pleasantly surprised to hear that currently, hydroelectricity is the world’s overwhelming renewable energy of choice. According to the most recent statistics from the Energy Information Administration (EIA) (2016), hydroelectric plants ranks as nine of the ten world’s lorgest electricity generating plants.